Would you like to save all of your conversations and more from Google Wave before it is shut down? Here’s some ways you can export your Waves today so your team can switch to other collaboration platforms. Google recently announced that they have ceased development of Google Wave, one of the more ambitious and confusing collaboration platforms. Wave is still currently running, but may be shut down in the near future. Google has promised to create a way to get your data out of Wave before they close it, but what if you’d like to go ahead and save your Waves elsewhere so you can switch to another collaboration platform today? There’s no direct way right now to save all of your Waves, but here’s some ways to save your Waves and get back to work. One of the best ways to export your data from Wave is to send it to Google Docs. 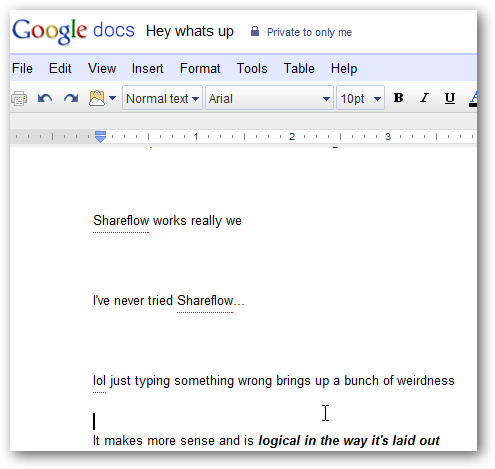 Google Docs is already a great collaboration platform, and you can live-edit your documents with friends and colleagues similarly to Wave. Here’s how you can do it using the Ferry bot. First, login to Wave, and select a Wave you want to export. Click the plus button beside the participants icons. 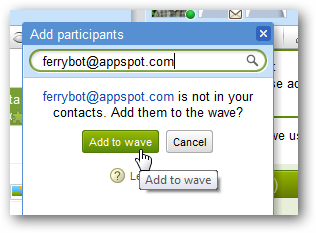 Now, enter ferrybot@appspot.com in the box, and click Add to wave to let it access your data. This will add a new Ferry blip to your wave. Select if you want to export the entire wave or only the root blip, then click Go at the bottom. Note that Ferry will automatically sync any new data in this Wave to Docs as well, though you can select Manual to turn that off if you like. 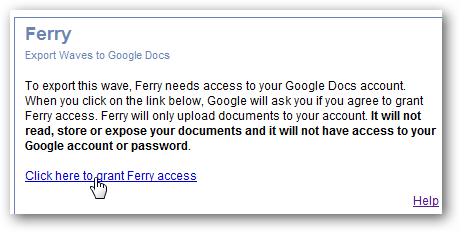 Click the link to give Ferry access to your Google account. 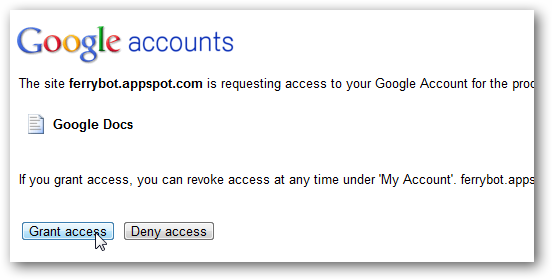 Google Docs will now open in a new tab, and ask if you want to allow Ferry to have access to your account. Click Grant access to continue. The bot may automatically redirect you to Google Docs to see your exported Wave, but if not, go to Docs.Google.com and you’ll see your new document from Wave at the top. Select it to view. Here’s one of our exported Waves in Docs. Notice that text formatting and links are preserved, but extra Wave content such as polls and some pictures will not be maintained in the conversion. Also, it’s hard to follow what was being said, as the text from each blip isn’t designated by the author or indented like it was in Wave. 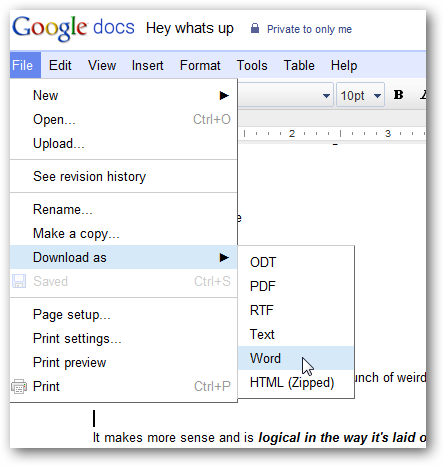 The good thing is, you can share the Google Doc with friends and coworkers, or download a copy as PDF, Word format, or more. This way, you can keep using your data from Wave even if it shuts down. Note that you’ll need to repeat this with each wave you want to export, so it may be time consuming if you’ve been using Wave a while. The good thing is, any extra data that is added to Wave by colleagues and friends will automatically be added to your Google Docs as well, so you won’t worry about missing out or losing anything. Another way to get your data out of Google Wave is to directly copy it and paste it into another application. Click near the top of the Wave and drag down to select all the content. Now paste it into your favorite word processor. 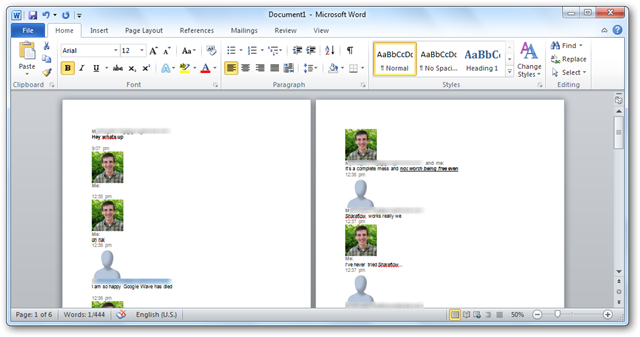 Here we’ve pasted the content into Word 2010. This preserved much more content from our Wave, though it took a few minutes to load all the data. Notice that the avatars and names are preserved, which makes it much easier to know who said what. It may create a huge document with all the images and spaces, but it gets almost everything from your Wave. If you end up with a huge document you might want to use image placeholders to display the document faster. Unfortunately you’ll have to copy each wave manually this way, so it can take a long time if you have a lot of Waves. But, it does preserve the content of your wave very nicely. 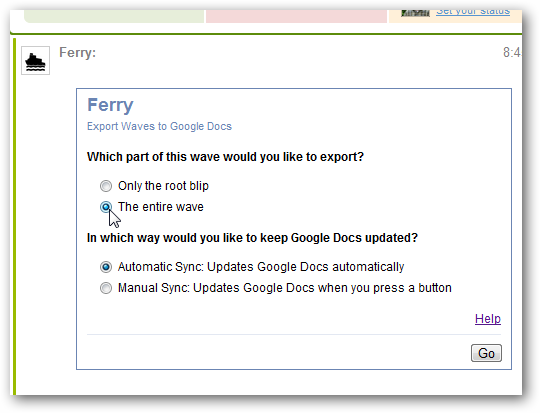 Although the Ferry bot isn’t the ideal way to export data from Google Wave, it is a fairly good way to make sure you keep your data from Wave backed up online. Pasting the content of your wave into Word is another good solution, especially if you’re certain none of your contacts will add anything else to existing waves. We’ll be looking for more solutions to move your data from Wave, and will let you know if we find anything else; until then, these are some solutions that can help you keep working without investing more time into Wave. 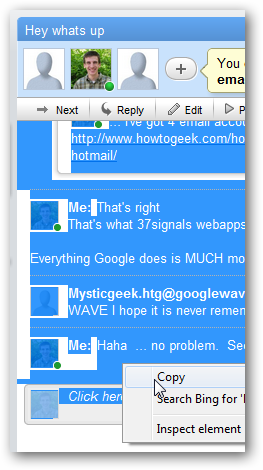 Would you like to try an alternate to Google Wave? Check out our look at Shareflow which is an easy straight-forward collaboration service. If you’d like to backup your Google Docs check out our article on how to export your documents from Google Docs.